TADA – cite! TADA (message) TADA – participate! The Triage Amalgamated DermoscopyThe examination of [skin lesions] with a 'dermatoscope'. This traditionally consists of a magnifier (typically x10), a non-polarised light source, a transparent plate and a liquid medium between the instrument and the skin, and allows inspection of skin lesions unobstructed by skin surface reflections. Modern dermatoscopes dispense with the use of liquid medium and instead use polarised light to cancel out skin surface reflections. AlgorithmIn mathematics and computer science, an algorithm (Listeni/ˈælɡərɪðəm/ AL-gə-ri-dhəm) is a self-contained sequence of actions to be performed. Algorithms can perform calculation, data processing and automated reasoning tasks. (TADA) can be utilized to guide the managementThis glossary term has not yet been described. decision for isolated lesions in a skin cancerThis glossary term has not yet been described. triage setting. The TADA algorithmIn mathematics and computer science, an algorithm (Listeni/ˈælɡərɪðəm/ AL-gə-ri-dhəm) is a self-contained sequence of actions to be performed. Algorithms can perform calculation, data processing and automated reasoning tasks. has been tested by clinicians and nurse practitioners for the identification of cutaneous malignancy and has demonstrated a sensitivityThis glossary term has not yet been described. of 94% and a specificityThis glossary term has not yet been described. of 72% . Unequivocal clinical and dermoscopic features of seborrheic keratosisThis glossary term has not yet been described., dermatofibromaDermatofibromas are hard solitary slow-growing papules (rounded bumps) that may appear in a variety of colours, usually brownish to tan; they are often elevated or pedunculated. A dermatofibroma is associated with the dimple sign; by applying lateral pressure, there is a central depression of the dermatofibroma. or angiomaAngiomas are benign tumors derived from cells of the vascular or lymphatic vessel walls (endothelium) or derived from cells of the tissues surrounding these vessels. Angiomas are a frequent occurrence as patients age, but they might be an indicator of systemic problems such as liver disease. They are not commonly associated with malignancy.This glossary term has not yet been described..
ColorsThis glossary term has not yet been described. and structuresThis glossary term has not yet been described. distributed in an organized or disorganized pattern. Lesions with colorsThis glossary term has not yet been described. and structures distributed in an organized (low degree of entropy) manner are considered organized. Lesions with colors and structures distributed in an asymmetric, chaotic, or random manner (high degree of entropy) are considered disorganized. Starburst patternThis pattern consists of peripheral globules, pseudopods or streaks (or a combination of them), located around the entire perimeter of the lesion. Blue-black or gray colorColor (American English) or colour (Commonwealth English) is the characteristic of human visual perception described through color categories, with names such as red, yellow, purple, or blue.. Shiny white structuresThis glossary term has not yet been described. (N.B. to see this structure requires the use of polarized dermoscopyThe examination of [skin lesions] with a 'dermatoscope'. This traditionally consists of a magnifier (typically x10), a non-polarised light source, a transparent plate and a liquid medium between the instrument and the skin, and allows inspection of skin lesions unobstructed by skin surface reflections. Modern dermatoscopes dispense with the use of liquid medium and instead use polarised light to cancel out skin surface reflections.!). Negative networkSerpiginous interconnecting broadened hypopigmented lines that surround elongated and curvilinear globules..
Any vascular structuresThis glossary term has not yet been described. or ulceration. Determine whether the lesion is clinically and dermoscopically an unequivocal seborrheic keratosis, angioma, or dermatofibroma. Experienced clinicians can also recognize other less common benignis any condition that is harmless in the long run lesions with certainty including sebaceous hyperplasiaThis glossary term has not yet been described., clear cell acanthoma(also known as "Acanthome cellules claires of Degos and Civatte," "Degos acanthoma," and "Pale cell acanthoma") is a benign clinical and histological lesion initially described as neoplastic, which some authors now regard as a reactive dermatosis. It usually presents as a moist solitary firm, brown-red, well-circumscribed, 5 mm to 2 cm nodule or plaque on the lower extremities of middle-aged to elderly individuals The lesion has a crusted, scaly peripheral collarette and vascular puncta on the surface. It is characterized by slow growth, and may persist for years. The clinical differential diagnosis includes: dermatofibroma, inflamed seborrheic keratosis, pyogenic granuloma, basal cell carcinoma, squamous cell carcinoma, verruca vulgaris, psoriatic plaque, and melanoma., and intradermal nevusThis glossary term has not yet been described.. If the lesion is considered to be an unequivocal benign lesion, the patient can be reassured and no further evaluation is required. If the lesion does not manifest a classic pattern consistant with one of the aforementioned benign lesions then one needs to move to the next step in the TADA. Step-2 is reserved for lesions in which the diagnosisis the identification of the nature and cause of a certain phenomenon. Diagnosis is used in many different disciplines with variations in the use of logic, analytics, and experience to determine "cause and effect". In systems engineering and computer science, it is typically used to determine the causes of symptoms, mitigations, and solutions of a benign neoplasm is not certain. These lesions are examined to determine if they display a dermoscopically organized or disorganized pattern. Dermoscopically disorganized lesions should be considered suspicious and either biopsied or referred to an expert for management. Dermoscopic asymmetry (i.e. 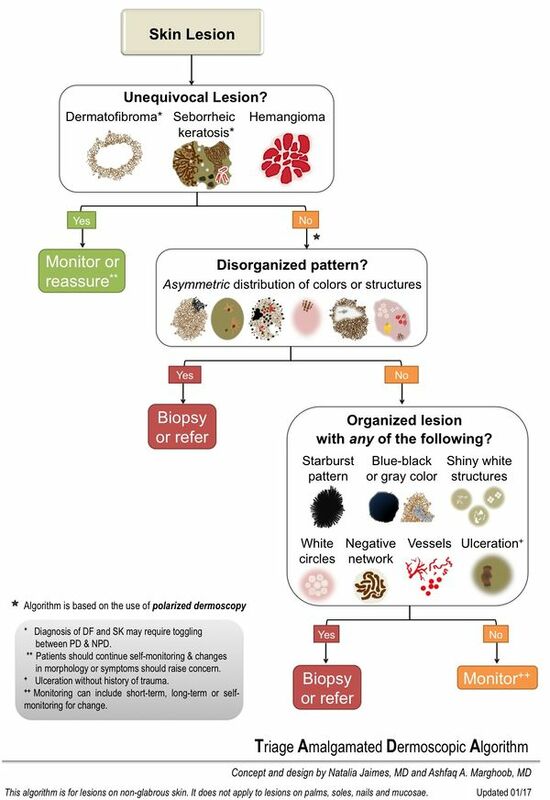 chaotic or disorganized distribution of colors and structures) is one of the most important and most reproducible (with high interobserver agreement) feature to helpRefers to giving assistance or support to others for mutual benefit differentiate benign from malignant tumors . Lesions that display an organized pattern move on to the last step in the TADA. Starburst pattern: Given the unresolved controversy as to the most appropriate management of spitzoid neoplasms, all lesions manifesting a starburst-like pattern, which can be seen in Spitz/Reeds neviThis glossary term has not yet been described. and occasionally in melanomaThis glossary term has not yet been described., should be considered suspicious, especially in older individuals. Blue-black or gray color: The presence of blue-black color in a symmetric organized lesion should raise concern for nodular melanomaThis glossary term has not yet been described. . Gray color has also been shown to be an important clue for skin cancer . Thus, symmetric lesions with a blue-black or gray color are considered suspicious in the TADA. Shiny white structures or negative networkSerpiginous interconnecting broadened hypopigmented lines that surround elongated and curvilinear globules. : Shiny white structures including white linesstreaksThis glossary term has not yet been described., blotches, strands and rosettesFour bright white dots or clods arranged together as a square (or a four leaf clover) are seen only with polarized lightThis glossary term has not yet been described.. In contrast, negative network and white circles can be seen with both polarized and non-polarized light. The presence of any of these structures in an otherwise symmetric lesion should raise concern for malignancy . Vascular structuresThis glossary term has not yet been described. or ulceration: Symmetric lesions revealing vascular structures such as dotted vesselstiny pinpoint vessels, serpentine vesselslinear irregular vessels with multiple bends. Seen with flat BCC and melanoma, glomerular vesselsThis glossary term has not yet been described., milky red globulesThis glossary term has not yet been described., or arborizing vesselsanalytic term is branched vessels; Bright red sharply in focus large or thick diameter vessels dividing into smaller vessels; BCC should raise concern for skin cancer. Lastly, any lesion that is ulcerated should raise suspicion for malignancy. In summary, any dermoscopically disorganized lesion that is not an unequivocal seborrheic keratosis, angioma or dermatofibroma should be considered suspicious for malignancy. Any dermoscopically organized lesion with a starburst patternThis pattern consists of peripheral globules, pseudopods or streaks (or a combination of them), located around the entire perimeter of the lesion, blue-black-gray color, shiny white structuresThis glossary term has not yet been described., negative network, vesselsThis glossary term has not yet been described. or ulceration should raise suspicion for malignancy. If the lesion is dermoscopically organized and does not reveal a starburst pattern, blue-black-gray color, shiny white structures, negative network, vessels or ulceration it can be monitored. NB: In addition, volar lesions with a parallel ridge patternVolar pigmentation forming lines, parallel, diffuse and irregular, along the ridges or cristae superficiales (raised portion of the dermatoglyphics) and any changing lesion in an adult patient should also be considered suspicious. ↑ Rogers et al. : Triage amalgamated dermoscopic algorithm (TADA) for skin cancer screening. Dermatol Pract Concept 2017;7:39-46. PMID: 28515993. DOI. ↑ Rogers et al. : A Clinical Aid for Detecting Skin Cancer: The Triage Amalgamated Dermoscopic Algorithm (TADA). J Am Board Fam Med 2016;29:694-701. PMID: 28076252. DOI. ↑ Carrera et al. : Validity and Reliability of Dermoscopic Criteriameasure of how well one variable or set of variables predicts an outcome Used to Differentiate NeviThis glossary term has not yet been described. From MelanomaThis glossary term has not yet been described. : A Web-Based International Dermoscopy Society Study. JAMA Dermatol 2016;152:798-806. PMID: 27074267. DOI. ↑ Argenziano et al. : Blue-black rule: a simple dermoscopic clue to recognize pigmented nodular melanoma. Br. J. Dermatol. 2011;165:1251-5. PMID: 21916885. DOI. ↑ Braun et al. : The significance of multiple blue-grey dots (granularityThis glossary term has not yet been described.) for the dermoscopic diagnosis of melanoma. Br. J. Dermatol. 2007;157:907-13. PMID: 17725673. DOI. ↑ Balagula et al. : The significance of crystalline/chrysalis structuresolt term for Chrysalis / Cristalline Structures in the diagnosis of melanocyticThis glossary term has not yet been described. and nonmelanocyticThis glossary term has not yet been described. lesions. J. Am. Acad. Dermatol. 2012;67:194.e1-8. PMID: 22030020. DOI. ↑ Pizzichetta et al. : Negative pigment networklines reticular hypopigmented around brown clods: an additional dermoscopic feature for the diagnosis of melanoma. J. Am. Acad. Dermatol. 2013;68:552-9. PMID: 23062610. DOI.